Earlier today, Justin Timberlake shared his latest single from Man of the Woods, unveiling a video for "Supplies." 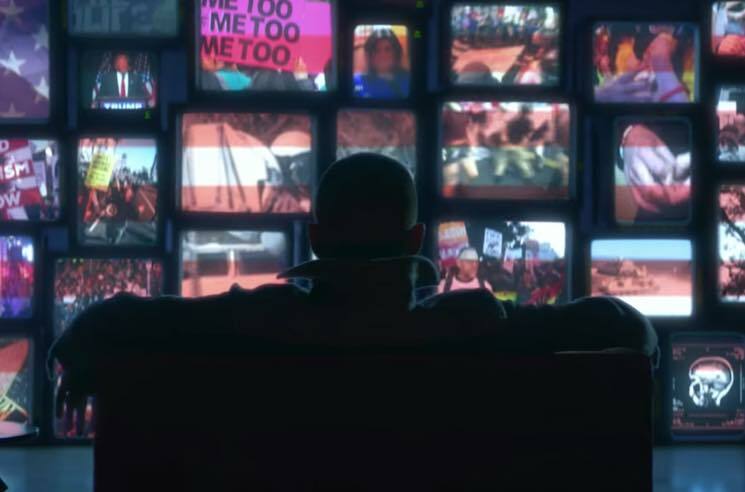 The clip sees the singer staring at a wall of televisions as they blast out footage from protest movements against the likes of sexual harassment, police brutality, racism and U.S. President Donald Trump. Timberlake then moves through a series of increasingly bizarre, futuristic backdrops before ending up on the other side of the apocalypse — where a little girl shouts at viewers to "Wake up!" Despite the singer's attempt at a socially conscious contribution to the world of culture, many have berated the video on Twitter for its ham-fisted and even hypocritical message. Some viewers have taken issue with Timberlake's way late acknowledgment of a system that places straight white males — like himself — in positions of priority, power and privilege, while others have pointed out that his support of the #MeToo movement against sexual harassment rings untrue due to his recent appearance in accused sexual abuser Woody Allen's Wonder Wheel. Furthermore, some are accusing Timberlake of plagiarizing his work by ripping off a 1984 Super Bowl commercial from Apple. Frankly, others just straight up don't like the song. See the growing list of complaints against JT on Twitter below. So Justin Timberlake is apparently trying to give us male ally/woke pop in his new song/video, Supplies. Just made a coworker watch that new Justin Timberlake "Supplies" video, to make her experience the awful with me. Her feedback: "It's like the Kendall Jenner Pepsi ad of music videos." I agree. Listening to Justin Timberlake's "Supplies." I feel like someone is taking a 💩 in my ears.